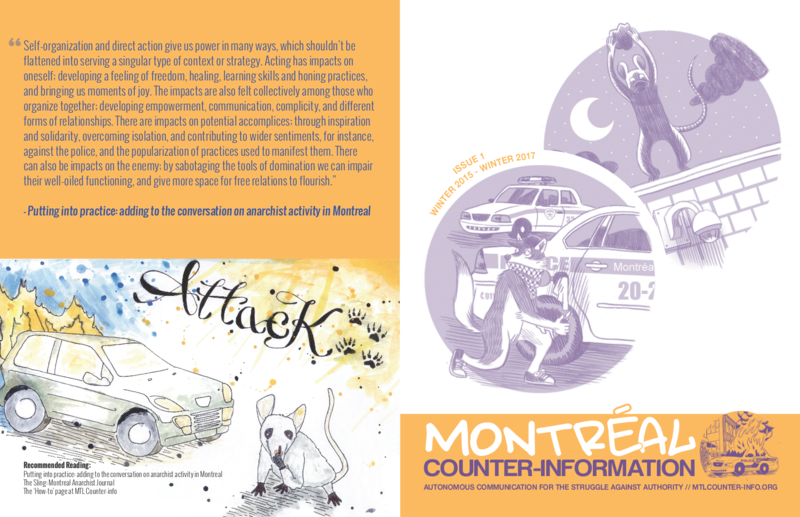 Montreal Counter-information is now a publication! The first issue collects content from the last two years. Future issues will be released every several months, to keep the material timely. For those with free access to colour printers, we’ve included a center-fold of 24 posters that can be attached with an elastic. You can get copies at La Deferle and L’Insoumise. If you’d like more copies for distribution, please get in touch! If you live outside Montreal and don’t have access to free printing, we’re down to print some for you if you can pay for shipping (and if you can’t afford shipping, still get in touch and we’ll try to figure something out).